Citadel Military College Says Prospective Student Can't Wear Hijab : The Two-Way The woman's family is considering legal action, according to a Muslim advocacy group. Citadel's president says a headscarf would violate the school's uniform policy, part of a core lesson on teamwork. 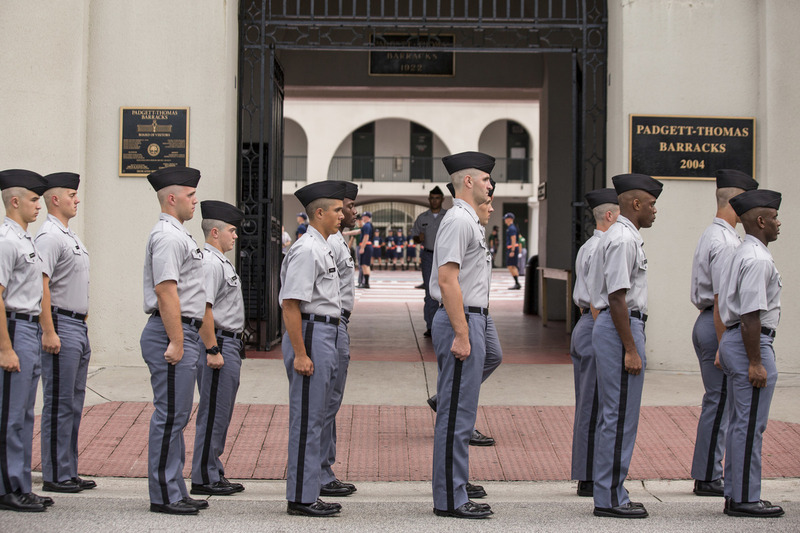 Citadel freshman cadets drill for the first time in their new uniforms in 2013 in Charleston, S.C. The school says it will not allow a prospective student to wear hijab because it would break uniform. The Citadel, the Military College of South Carolina, says it will not allow an admitted student to wear a Muslim headscarf. The woman's family is considering legal action, according to a Muslim advocacy group. In a statement Tuesday, Citadel President John Rosa says, "Uniformity is the cornerstone of this four-year leader development model." Through a "relinquishing of self," the lieutenant general says, "cadets learn the value of teamwork to function as a single unit." Ibrahim Hooper, spokesman for the Council on American-Islamic Relations, said the student cannot attend without the accommodation. "Wearing hijab is viewed as a religious obligation," he told NPR via email. CAIR said in a press release that it is "considering legal options to challenge" the decision. Sherine Hafez, whose work focuses on women's studies and Muslim societies, tells The Two-Way that she thinks gender intersects with religion in this case. As a professor, she has seen students who wear headscarves underestimated or presumed "docile." "It's not just a religious issue, but it is a feminist one because they are women," says Hafez, an associate professor of gender and sexuality studies at the University of California, Riverside. The Citadel, which is a public college, admitted its first female cadet in 1995. (Though that required a legal battle, as The Los Angeles Times reported, and she dropped out a week after winning the fight.) The military college says that "much has changed since 1995" and wrote in 2005 that women are now more integrated into the Cadet Corps. "Obviously being a woman who is religious is not getting her access to an opportunity," Hafez says of the current dispute. "So there is a sense here that you can't deny discrimination." " 'The military departments will accommodate individual expressions of sincerely held beliefs (conscience, moral principles, or religious beliefs) of service members' unless it might affect military readiness or unit cohesion, the updated policy on religious accommodation said." CAIR senior staff attorney William Burgess said in a statement that The Citadel "should offer the same accommodations" as the military, adding, "No student should be forced to choose between her faith and an education that can facilitate future service to her nation." The Muslim student's request became public via a cadet's Facebook post, which argued against allowing the hijab. Nick Pinelli wrote, "Equality means the same set of rules for everyone. Not different rules for different people. It means accepting everyone, and giving them the same tools to succeed as the rest." The Washington Post says that other objections have been raised "because exceptions have apparently not ever been made for other religions. Christian cadets have been told not to display crosses, for example." On Tuesday, Pinelli called the school's decision not to allow the student to wear hijab "thoughtful."